Meet Our New Community Host, Gabe! 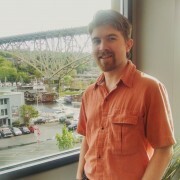 Help us in welcoming our new community host Gabe Herbert! Get to know Gabe a little better. He is pretty new to the Fremont area, so please suggest some great places for him to explore! What do you do and where can we find out more? Professionally, I’m a web developer, primarily using WordPress. I also have a lot of IT experience. What is your favorite beer/wine/cider spot in seattle? What is the best place for a bite? I’m trying to kick the “fast food sushi” habit- Toyoda Sushi in Lake City is one of my favorites. Bizarro is delicious and fun for Italian. And I’ve got to throw in Plum Bistro. I’ve studied martial arts for years and am just getting into Capoeira. Yoga is an essential foundation for my physical practices. I’m also a bassist, currently looking for a new project. It might go without saying that I’m a big computer geek. Someday I want to build robotic fountains. https://thinkspace.com/wp-content/uploads/2013/11/website-thinkspace-logo-teal-155x69.png 0 0 thinkspace https://thinkspace.com/wp-content/uploads/2013/11/website-thinkspace-logo-teal-155x69.png thinkspace2015-04-24 16:22:192015-04-24 16:22:19Meet Our New Community Host, Gabe! “Can I have one of everything?” | New Tech Eastside, April 14 What do you like most about working at thinkspace?